A global partnership for children, including the WHO and UNICEF, report that annually, 4 million babies die within the first 30 days of birth. Why are 4 million babies dying? Concise 2 and 1/2 page article. The common causes are infection, birth asphyxia and premature (including low birth weight) births. Premature and low-weight babies are particularly susceptible to hypothermia and need to be kept warm. In the well-off world, such babies are placed in expensive incubators (costing upwards of $10,000), while vital signs are monitored and stabilized. In much of the developing world such luxuries do not exist and babies continue to die off. Multinational medical device companies are quick to donate expensive equipment to far off locales. Consider that in places where infant mortality is very high, there is likely no electricity to power incubators and no trained personnel to operate them. Most of the equipment is completely useless and gathers dust. This lack of understanding local constrainsts leads me to believe that most expensive equipment donations are made primarily for tax right-offs and a way to showcase social responsibility to shareholders. But thankfully, social entrepreneurs in small teams are continuing efforts to develop baby incubators for the developing world. 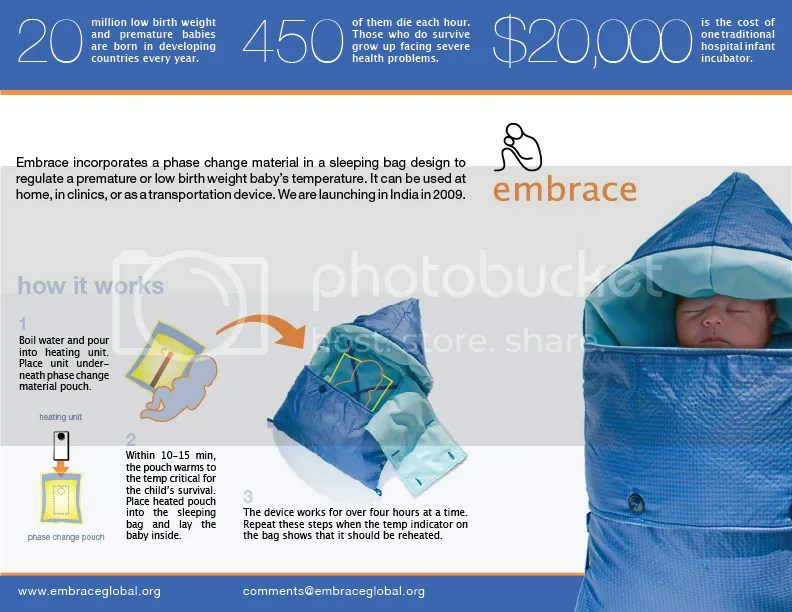 Here is a creative solution by EmbraceGlobal: A sleeping bag-like device with an add-on warming pouch. It does not require electricity, is portable and costs $25. At that price, they are near disposable and can go home with the baby. Most likely, parents don’t have anything nicer to put the baby to sleep in. A Neonatologist I spoke to voiced concern that for critical babies, it is important to be able to see the chest of the baby rise and fall as it breathes. I think this can be addressed by a zipper (or velcro) on the sides of the bag. These will also make it easier to get the baby in and out of the bag, and provide ventilation. I think $25 is still a steep price for essentially a wrap-around quilt. If folks can build a laptop for $100, then such a sleeping bag should not cost more than $1! Yes, One dollar! Any of you have ideas for modifying the designs to address local needs? Can this be made of locally sourced materials? How about involving micro-finance based women’s groups to fabricate/assemble them locally? This could improve their livelihood as well. Perhaps this may trigger other solutions in the local populations. Make it for $1! Any takers? this is such a wonderful idea, arun. i would also think the velcro would help out with getting the baby in and out of the bag! exactly! The velcro sides would help immensely! A friend actually forward this to one of the Founders!